Van Heusen’s latest window brings a piece of green, which is carried forward in in-store VM through props and merchandise display. 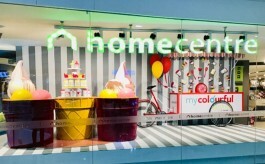 The window concept is in line with the brand’s new store design concept which is fresher than before. Workwear brand from Aditya Birla Fashion & Retail (ABRFL), Van Heusen has recently launched their Spring-Summer collection 2018 with a window that brings the freshness of spring with a green pasture to all of their 220 retail stores – quite literally. 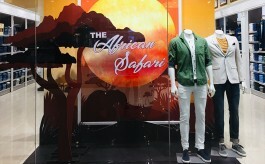 Spearheaded by Jack Ribas - Chief Creative Officer at Aditya Birla Fashion & Retail, the latest store design concept has re-imagined the brand in a fresher look using lot of green thereby prompting the window concept to boast something green. Explaining more on the VM concept and execution, Diptendu Sekhar Saha, Head – VM, Van Heusen told Retail4growth, “We developed the concept based on the mandate - Go ahead - Think bold - Think fresh - Think green. Window conceptualization is based out of green theme with green grass backdrop, pebbled flooring, green merchandise mannequin displays supported by play of lights and shadows.” Window theme is carried inside store for nesting table and walls with same freshness through props as well as merchandise display.